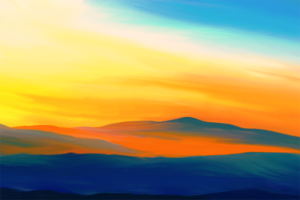 Digital painting of a seascape in the sunset. An ocean in the sunset with clouds that are dramatically illuminated from the setting sun. The painting is digitally made in a more loose way, using the palette knife tool in ArtRage (one of my favorite tools). The painting is inspired by a photo, but I have slightly changed the layout and also exaggerated the colors for a more surreal effect.